Learning to cook without recipes can be not only a huge time-saver in the kitchen, but a money-saver as well. Soup is an incredibly versatile food. 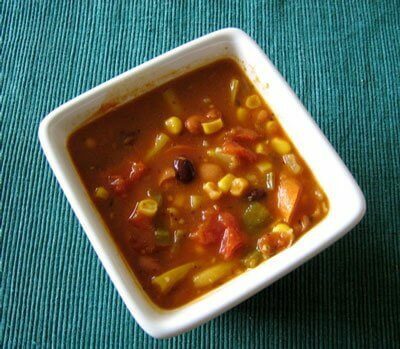 It can be hearty and chunky, or light and refreshing, vegetable based or full of meats, beans and grains. It can be a meal in itself or a side dish. It can be made using specific, fresh ingredients, or very frugally by putting together the week’s leftovers. Most importantly, it is nourishing and satisfying. When made using homemade bone broth, it is also healing and aids greatly in proper digestion and assimilation of nutrients. Soup should be a standard in every whole food home. The first step in making any soup for me is to heat up some oil in the pot, with no liquids added. It might be butter if I’m making a roux for a creamy soup, or just some coconut oil or beef tallow to fry up some onions and garlic in. If I’m making a soup with vegetables in it, like chopped carrots, celery, peppers or mushrooms, I always add these veggies to the oil and onions. Letting them saute for a few minutes before adding any broth or liquids add more flavor to the soup. I used to think that soup needed those little cubes or cans of store-bought broth to taste good. I was so wrong. Once you get used to using homemade bone broth in soups, nothing will ever taste the same again. For a tutorial in making bone broth, see this post. For more on how to get just the right consistency to your broth and to ensure that you are drawing the gelatin and nutrients out of the bones, read What Bone Broth Should Look Like. Add your broth after you’ve sauteed the veggies for a few minutes. You’ll want to bring the soup to a boil as you’re tossing in more of the ingredients listed below. Make sure that you cook it long enough for things like carrots or potatoes to cook sufficiently. If you’re making a creamy soup, start adding ingredients only after your roux is complete. Add the broth or other liquids next, and then add any vegetables, meat or fish, beans, etc. This is the fun part. There are countless ingredients that you can chuck into a soup and it’s hard to go wrong. Sometimes I make soup by cleaning out my fridge. Other times I just start adding ingredients that seem like they would work well together. I might have a specific goal in mind (a seafood chowder, an Italian style-soup, a way to use up extra cauliflower). Any way you approach it, you can make something that will fit the bill. I tend to think that this makes or breaks a soup. Seasonings can take ordinary ingredients and make them into something really extraordinary. The key is to try to think of flavors that might mesh well with what you’ve already got going, and that will mesh well with each other as well. If you’ve added a lot of hearty vegetables with beef, you could give it an Italian twist by adding a can of tomatoes, putting in some leftover or frozen beans, and lots of herbs like basil, oregano, rosemary, thyme, etc. A bit of apple cider vinegar or even balsamic vinegar might be nice (just a splash). Garlic is always good. You could take that same hearty beef and veggie soup, and give it more of a Mexican feel. Add some cumin, paprika, oregano, garlic and onion powder, and some chili or cayenne. Frozen corn is a nice addition. 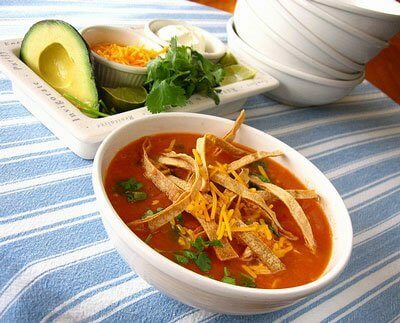 Serve it with tortilla strips or crumbled chips on top, some sour cream, and shredded cheddar cheese. Avocado would also be nice. A tangy Thai influenced chicken soup, with peas, bean sprouts, ginger, garlic, and lemon or lime. A warming, root veggie soup, similar to a Scotch Broth. Think carrots, turnips, parsnips, with a beef or lamb base, and some pot barley as well. Onions and leeks, parsley and simple salt and pepper work well to season it up. A creamy cauliflower/broccoli soup, using a chicken base, some dry mustard, lots of sea salt, and cheddar cheese. A curried squash soup. Try adding onion and garlic, apples, maybe some coconut milk, and of course, curry powder. Don’t underestimate the importance of adding seasonings ON TOP of your soup. A sprinkle of Parmesan or grated cheddar cheese. Fried tortilla strips or sourdough croutons. Creme fraiche drizzled, or a big dollop of sour cream. Fresh herbs like basil, oregano or cilantro strewn across. These are the finishing touches that add so much. Yes, really. Blending soup is one of the keys that I have learned for helping flavors to meld together and really bring out the best in each other. I use different levels of blending depending on the soup. Some soups, like a Curried Apple Squash, would benefit from complete blending so that they’re smooth and creamy. Some, like a Chicken Lentil Vegetable is really nice pseudo-blended. Enough to mix the flavors and create a thicker, richer soup base but not so much that you lose the veggie and chicken chunks. 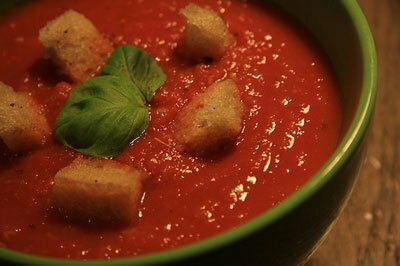 Almost every soup benefits from at least a few quick pulses of a hand held blender, regardless of how smooth or chunky you want the texture to be. I just do it straight in the pot, and there is virtually no extra cleanup. I love it. Do you make soup from scratch? What types of flavors and combinations are your favorites? Gardening Season Has Officially Begun! Next Post: Upcoming: Four Families are Going to Get a Real Food Makeover! We love making soup around here. I do it at least once a week, we have one planned soup night and usually inbetween too. I miss my crockpot though. Can you believe it cracked 1 month after the warranty was done. We can’t get a new one now (we’re doing Dave Ramsey TMM, and I don’t feel its an emergency). I also love to make a huge batch, and freeze it for a later easy meal on a bad day or a day when I need a fast meal, paired with something like salad and tea biscuits, or even sandwhiches. I love squash soups. Our current favourite is roasting the squash, onions, carrots, garlic and some sea salt, olive oil and rosemary, and then dumping them in with the homemade turkey or chicken broth (made before and frozen and thawed) and then pureeing. I LOVE LOVE LOVE having a gift now of a handheld blender. I highly recommend it. I used to use my regular blender. Talk about messy and I got burned and had messes lots of times. We also love turkey soup. I can get turkies cheaper than chickens per pound so I use a lot of that. I love them with thyme and brown rice. We really find the rice makes a nice soup vs. any other grain or pasta. We also have a chickpea soup that we love that has yams, tomatoes (fresh or canned its versatile) and also has turmeric, cinnamon, and some other things. I’ve also found that often you can change up a recipe- being creative without really making your own, like using carrots instead of yams, chard or kale instead of spinach, etc. Can you tell we love soup? Thanks for the tips. I have a pot of stock bubbling right now for Saturday’s soup!! We like beef/venison stew, chicken noodle, carrot/potato, creamy wild rice with chicken, and my mil’s tomato soup(like the tomato juice with 8 on the can) which we can in the fall and use as a base in hot dishes also. Thank you for the idea of which spices to use in certain soups. My son asked me if I knew more about spices. I am limited to the ones our scandinavian heritage passed down and they are quite mild. Would you consider a series on how to use spices and what combinations go together well with specific foods? I love making soup! Our favorites are chicken tortilla, vegetable beef, tomato, chicken noodle, taco soup and a new found, absolutely delicious favorite – roasted red pepper and corn chowder. 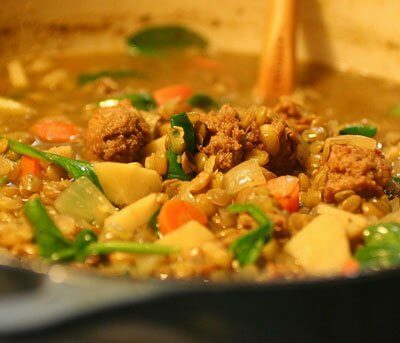 My husband loves it and I have brought it as a meal for new moms and get asked for the recipe. So good!!! I LOVE soup and I really never use a recipe anymore. I might look some up in order to get some ideas, but generally I just mix things together too. I think it’s easier when you have more experience in the kitchen. A few years ago nothing worked out for me — not soups, spaghetti sauce, and forget baking. But as I’ve learned about little details I’ve been able to create anything I want and it almost always comes out tasting great! Good tutorial for those newer to it, though! .-= Kate´s last blog ..Living for Joy =-. Mmmmm this makes me want to go start a pot! My favorite is my mom’s taco soup. Ground beef (cooked before), taco seasoning, a jar of salsa, frozen roasted corn, black beans,garlic, crushed tortilla chips to thicken, and a more crushed chips and a sprinkle of cheese on top! I make a huge pot and eat it all week and am sad when its gone! .-= Kait Palmer´s last blog ..The Last Day of the Challenge – Day 54 =-. I love make homemade soup but I am kind of lazy so I just throw everything into the crockpot and let it cook all day while I tend to other things. I make some fresh bread in the bread machine as well. By supper I have a nice hot meal and warm bread to dunk! And the house smells like I slaved over the stove all day! LOL!!! .-= Mrs Little´s last blog ..Thought Spots – Review and Sale =-. I love soup. So warming, so versatile, and depending on the kind of soup can be very filling. 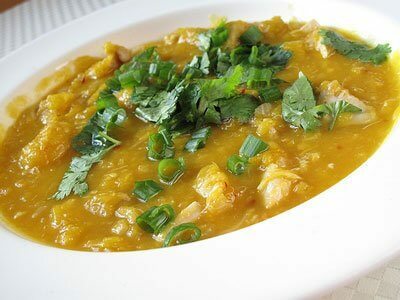 I recently made a coconut lentil soup which is usually one of my staples during Lent. I have never really made soup from scratch before but as you were explaining the steps I was mentally tracking along and realized I don’t need to follow a recipe anymore. I know those steps, lol. .-= Michael´s last blog ..Mo’ Buttah Mo’ Bettah – Musings Around The Web =-. Thank you for putting together this tutorial! I used to joke that I could hardly even boil water without a recipe, but thanks to all these wonderful NT-related blogs, I’m becoming more comfortable experimenting, at least when it comes to soups and stews. Hi! New to your site and was getting ready to check the post on gardening when I saw this and just “had” to stop by. =) Love soups and found your notes very interesting…thanks so much for sharing! Like another comment-er, I would love to see a list of what herbs go well with what meats, etc…. I’m not very adventurous in that area and usually stick with tried-and-true. My favorite soup to make is “chicken corn soup.” I usually make it the same day that I’m boiling up my own pot of stock…after a couple hours of bubbling awa on the stove, I remove the chicken to debone/chop and whatever stock I want to save and refrigerate/freeze for another day, I put my kitchenaid food processor to work (something I would’ve NEVER purchased for myself…but the best gift my MIL ever gave me=). I shred carrots, celery, onions, and potatoes and throw them all in the stock pot with some of the chicken and broth…then I add salt, pepper, a bag of frozen corn, and some fresh parsley and heat through before serving with crackers or a slice of buttered bread. We also all absolutely love french onion soup, too! Saute a bunch of onions in butter. Add beef broth, a little worcestershire sauce and some bay leaves. Sits well on low in a crock pot all day, too. And you can add some homemade bread/croutons and cheeses right before serving. I am just getting brave enough to try soups on my own. I make a pork tortilla recently that I was super pleased with. It’s the seasonings and amounts that have traditionally held me up. My husband is so much better at the making up recipes than I am–I usually tweak recipes until they are beyond recognition. I do want to work on this, though. Thanks for sharing. .-= [email protected]´s last blog ..Cinnamon Roll Recipe =-. How do we make a soup with raw chicken instead of already cooked/left over chicken? I have some bone-in parts and, for flavor and added nutrition, I want to be able to cook the meat into the soup and then shred the meat off the bones (and remove the skin) before serving. Is that feasible? Also, does the chicken have to be thawed or can I start with frozen or semi-thawed chicken parts since it will all be submersed in the simmering soup for so long? Also, is it possible to make a creamy soup without using flour? @Kaitlyn, You can definitely do it with raw chicken, but it will need to simmer for a lot longer. If you’re wanting to get the nutrients out of the bones for your broth, you will want it to simmer up to 12 hours, although I don’t know what the chicken will be like at that point. If you’re adding other broth and just wanting the chicken for the flavor and meat, then it should be fine to just simmer for a couple hours. To make a creamy soup without flour you can either use something like arrowroot powder instead of flour when you’re making the roux (with the melted butter, then the arrowroot, then add your liquids like milk or broth). Another way to do it is to add potatoes and blend them up, which adds a nice, creamy thickness. Yes, I made soup this way for many years, just boiling the heck out of a whole chicken. I suggest not adding veggies until after you’ve deboned the meat and added it back. However, it’s a pain. Either you have to debone hot cooked chicken, or you have to cool the whole pot in the fridge overnight and then deal with it cold and greasy. Since I LIKE roast chicken better anyways, I started saving the carcass to make broth. It’s a much EASIER broth to make because you just strain the broth and throw out the bones without having to sort through everything. Also, when you do a tueky at the holidays, if you make broth in the roasting pan after having cut off all the meat, you can do it over two burners and it largely cleans the pan for you. Sometimes it depends on costs though. I recently got a great deal on a 20 lb package of necks and backs from a farm that pastures it’s chickens. I did boil them up and do the sorting because it was “worth” it to generate not only many quarts of broth, but many pints of cooked chicken for use in soup and casseroles too. But for the most part, it is just so much easier to generate broth from carcasses and avoid all that sorting business. Sometimes I find the best soups are the product of improvisation! Nothing beats the satisfaction of coming up with a delicious meal without referring to any recipe, or predetermined plan! I just love your website! I have been searching for instructions just as these on making soups from scratch for for months on line. While I do love Chinese food, living as an expat in China for the past few years, I just find it so unpleasant to be without any other option, and lacking the ingredients to make some of my favorite dishes from home. I love soups, including Chinese soups, but I really began to miss the heartier, broth based beef soups, italian style soups, creamy chowders, tomato based soups and so on. Chinese soups, while delicious, lack the rich flavors and varied vegetable combinations of our western soups. They generally consist of a clear broth, a green leafy vegetable and egg drop and sometimes some sort of meat. They do have fish soups, and tomato beef soups, in the summer, while the green hard bean soup looks tantalizingly like split pea, it is served cold and sweetened, something I cannot adjust my tastebuds to. I love the fish head soups here but really, I just wanted to venture into making my own soups and didn’t really know where to begin. I am so happy to find this post. Even at this very moment, my crockpot is bubbling away as I prepare a beef bone broth. Thanks so much for all your efforts. Just wanna comment on few general things, The website pattern is perfect, the subject material is very good : D.
Corn is not on the Gaps diet. I see it in your soup picture. It’s a general guide to making soup from scratch. Omit or add ingredients that suit you, and your dietary requirements/restrictions. Thank you so much for this article! As a gluten and lactose free person I am always on the look out for clean healthy foods that will make me feel good, but as an amateur cook I often don’t know where to begin with the recipies. This article was an immense help, it really explained things well and gave me some confidence, and since I typically work better when making things from scratch, it was perfect! Can’t wait to try it out! We blend our soups a LOT! Kids eat veggies they otherwise wouldn’t. Our fave right now is chicken/turkey stock, potatoes, and broccoli. Hi, my stock turned out like jelly, it was so thick, how much should i add of it to my soup?. Do you think that i should do half and half water with it?. That means its awesome stock. 🙂 It should liquify when warm, then gel up when cool. Once you heat it up, you shouldn’t need to add liquid, but you can add a bit of water if you feel like you need to. Not too much, though, or you’ll water down the flavor. Wonderful post very helpful! I love cleaning out my fridge right into my crock pot your post really helped in figuring out how to tie things together. Thanks for writing this! I now refer to this post in my head as “soup theory” and have had lots of success with different variations. Love it!